March 2017 - Maplewood of Sauk Prairie In the final stage of this disease, people may need help with personal care and activities around the clock. They may develop difficulty communicating or experience changes in physical abilities. They may become less able to walk, sit up, or swallow. They often lose awareness of recent experiences and do not respond to their surroundings. Caring for People with Alzheimer's It can be difficult to care for people with Alzheimer's Disease as they begin to need help more and more frequently. Many families find they are unable to handle the advanced needs of their loved ones who suffer from Alzheimer's. Facilities like Maplewood Sauk Prairie can ease some of the burden with kind, professional, and highly trained staff that will care for your loved ones and allow you to be highly involved in their treatment and daily life. We are happy to speak with you and give tours of our facility, so if you would like to talk about Alzheimer's care program, give us a call at (608) 643-3383. Maplewood is like a good bottle of aged, fine wine. Only time and quality ingredients can create the complexities needed to become a superior product. At Maplewood, it’s about the care. You’ll receive emotional & physical care by certified, trained staff members in an ideal environment. Maplewood’s memory care unit was built to create the best experience for a person with dementia. Too much stimulation heightens anxieties so there are a small number of residents in the memory care community and each resident has a private room and private bathroom. It is a cheery, safe place with an outdoor courtyard, where residents truly feel at home. •	Residents experience consistency and compassion. At Maplewood they are in contact with the same staff even at a time when other facilities are hiring temp agencies to fill openings. •	Trained staff – every employee at Maplewood has training on Alzheimer’s/Dementia twice a year. They know how to approach a person with memory decline, understand behaviors they exhibit, effectively act and react to residents and use successful wording. •	Every employee caring for your loved one is at the very least state certified as a CNA, Certified Nursing Assistant. This means your loved one will experience the best care methods. This includes proper hygiene, injury prevention, averting infections through excellent incontinence care and reducing complications such as aspiration, pneumonia or skin breakdown. •	Maplewood has nurses on staff 24 hours a day, 7 days a week. This means a nurse will respond immediately to a concern. Some facilities have a nurse “on call”, which means a lag time for getting a response when there is a critical situation. •	Experienced employees regularly help on a personal and professional level by giving guidance and support. It is common for family members to consult with Maplewood staff about what to do for their loved ones. •	3.5:1 ratio for resident to staff member. •	On-site speech, occupational and physical therapy with licensed therapist, 6 days a week. •	Use non pharmaceutical interventions such as diathermy & ultra sound to reduce both falls and pain management. •	Maplewood uses a multi-disciplinary approach. They look at nutrition, dehydration, overall medicine management and activities that encourage a positive distraction and will give residents purpose. With dementia, memory loss is only the tip of the iceberg. A person can’t get back the memory that has been lost. At Maplewood we stimulate what remains. Individualized care plans are created by a nurse with coordinating activities that work around any skills which have been affected. For instance, music, dancing, rhythms and prayers are parts of memory that will always remain, so those activities are incorporated into daily activities. To make an analogy many people can relate to, as a parent, you instinctually want your child to be cared for by the best person. You can utilize an inexperienced teenager or a very experienced adult and there will be a very different level of care. It is the same when looking for senior care. At Maplewood there is tremendous “value added” when care providers have specialized CNA training. More than 5 million Americans are currently living with Alzheimer’s. It’s likely that you already know someone who has Alzheimer’s or who is caring for a loved one with Alzheimer’s. It can be frightening to find out that family member is suffering from this disease, but sometimes knowing more about what to expect can help. Although Alzheimer’s affects all individuals differently, there are generally three stages that people experience. However, your loved one may move through these stages at a different rate, and sometimes the stages overlap. Your loved one may exhibit some symptoms of early-stage Alzheimer’s and some symptoms of middle-stage Alzheimer’s, for example. Alzheimer’s disease begins making changes in a person’s brain long before symptoms are apparent. Theses changes can sometimes be detected with brain imaging like fMRI, but you won’t notice any difference in the person’s day to day behaviors. This stage is referred to as “preclinical Alzheimer’s,” and it is not considered one of the three phases since no symptoms are apparent. Preclinical Alzheimer’s can last for several years before changes in the person’s habits or lifestyle become apparent. During this first phase of Alzheimer’s, problems may be apparent only to close friends or family members who spend a lot of time with the person. Doctors may also notice memory or concentration problems during detailed interviews. For the most part, however, this phase may be undetectable from a distance. People with early-stage Alzheimer’s often work, participate in social activities, drive, live alone, and function independently. They may begin to have memory lapses more often than they used to. All people have memory lapses once in a while, like forgetting what day of the week it is and later remembering, or not being able to think of a particular word or object name for a little while. However, people with early-stage Alzheimer’s will begin to have more frequent lapses. They may have more trouble than usual remembering names when meeting new people, often forget things they’ve just read, or have increasing trouble with planning and organizing. After being diagnosed with Alzheimer’s disease, which can sometimes happen during the early stage, the average person lives four to eight more years. However, this is only an average, and some people live up to 20 more years. Middle-stage Alzheimer’s is typically the longest phase, and it may last for many years. People in this stage will require gradually increasing levels of care, and will exhibit more serious symptoms. Damage to nerve cells in the brains of people with middle-stage Alzheimer’s may lead to these people acting differently than they used to. They may get frustrated or angry often or stop doing routine things like bathing. They may find it difficult to express their thoughts, which can make them more frustrated. During this stage, people typically become increasingly forgetful about important events and their own past, get confused, and develop erratic sleeping habits. They may also experience personality changes that require a great deal of patience from caregivers and family members, like becoming moody, suspicious, and compulsive. In the final stage of this disease, people may need help with personal care and activities around the clock. They may develop difficulty communicating or experience changes in physical abilities. They may become less able to walk, sit up, or swallow. They often lose awareness of recent experiences and do not respond to their surroundings. It can be difficult to care for people with Alzheimer’s Disease as they begin to need help more and more frequently. Many families find they are unable to handle the advanced needs of their loved ones who suffer from Alzheimer’s. Facilities like Maplewood Sauk Prairie can ease some of the burden with kind, professional, and highly trained staff that will care for your loved ones and allow you to be highly involved in their treatment and daily life. We are happy to speak with you and give tours of our facility, so if you would like to talk about Alzheimer’s care program, give us a call at (608) 643-3383. Maplewood is like a good bottle of aged, fine wine. Only time and quality ingredients can create the complexities needed to become a superior product. At Maplewood, it’s about the care. You’ll receive emotional & physical care by certified, trained staff members in an ideal environment. Maplewood’s memory care unit was built to create the best experience for a person with dementia. Too much stimulation heightens anxieties so there are a small number of residents in the memory care community and each resident has a private room and private bathroom. It is a cheery, safe place with an outdoor courtyard, where residents truly feel at home. •	Residents experience consistency and compassion. At Maplewood they are in contact with the same staff even at a time when other facilities are hiring temp agencies to fill openings. •	Trained staff – every employee at Maplewood has training on Alzheimer’s/Dementia twice a year. They know how to approach a person with memory decline, understand behaviors they exhibit, effectively act and react to residents and use successful wording. •	Every employee caring for your loved one is at the very least state certified as a CNA, Certified Nursing Assistant. This means your loved one will experience the best care methods. This includes proper hygiene, injury prevention, averting infections through excellent incontinence care and reducing complications such as aspiration, pneumonia or skin breakdown. 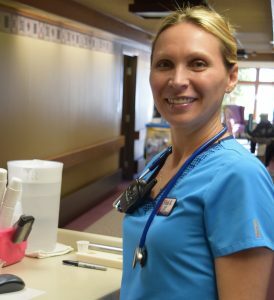 •	Maplewood has nurses on staff 24 hours a day, 7 days a week. This means a nurse will respond immediately to a concern. Some facilities have a nurse “on call”, which means a lag time for getting a response when there is a critical situation. •	Experienced employees regularly help on a personal and professional level by giving guidance and support. 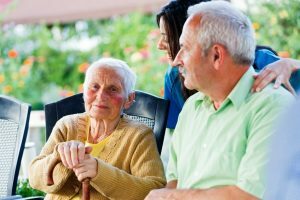 It is common for family members to consult with Maplewood staff about what to do for their loved ones. •	3.5:1 ratio for resident to staff member. •	On-site speech, occupational and physical therapy with licensed therapist, 6 days a week. •	Use non pharmaceutical interventions such as diathermy & ultra sound to reduce both falls and pain management. •	Maplewood uses a multi-disciplinary approach. They look at nutrition, dehydration, overall medicine management and activities that encourage a positive distraction and will give residents purpose. With dementia, memory loss is only the tip of the iceberg. A person can’t get back the memory that has been lost. At Maplewood we stimulate what remains. Individualized care plans are created by a nurse with coordinating activities that work around any skills which have been affected. For instance, music, dancing, rhythms and prayers are parts of memory that will always remain, so those activities are incorporated into daily activities. To make an analogy many people can relate to, as a parent, you instinctually want your child to be cared for by the best person. You can utilize an inexperienced teenager or a very experienced adult and there will be a very different level of care. It is the same when looking for senior care. At Maplewood there is tremendous “value added” when care providers have specialized CNA training.